India's External Affairs Minister Sushma Swaraj fired a salvo at Pakistan at the United Nations General Assembly Saturday. “We are completely engaged in fighting poverty. Alas, our neighbour Pakistan is seems only engaged in fighting us,” she said and asked the Pakistani leadership on why it “spurned” Prime Minister Narendra Modi’s hand of peace and friendship. Swaraj also took a dig at China when she asked the UN to arrive on a common definition of terror and how even the UN Security Council cannot agree on listing of terrorists, an apparent reference to the Chinese blocking Masood Azhar’s inclusion on the terror list. While she mentioned the refugee crisis the world over, she did not touch on the crisis in the immediate neighbourhood in the Rakhine state in Myanmar, which has lead to over four lakh Rohingya escaping to Bangladesh. In a blistering attack, days after Pakistani Prime Minister Shahid Khakan Abbasi called India a state sponsor of terrorism, Swaraj took a dig, reminding how when the Pakistani PM was delivering his speech, audience wondered “look who is talking”. She said how Abbasi wasted too much time accusing India of terror and violation of human rights. “A country that has been the world’s greatest exporter of havoc, death and inhumanity became a champion of hypocrisy by preaching about humanity from this podium,” she said. “We produced scholars, doctors and engineers. What have you produced? You have produced terrorists,” she said as she spoke in Hindi, yet again, in her second straight address at the UNGA. Her speech was hardly different from what she said in 2016. Since then there has been little headway in India-Pakistan ties. The last address was delivered as Jammu and Kashmir witnessed one of the worst crisis in recent years after the encounter of Hizbul Mujahideen’s Burhan Wani. Swaraj responded to the Pakistan Prime Minister’s reference to UN resolutions on Kashmir, demands for a special envoy on Kashmir and comprehensive dialogue. She reminded him of 9 December, 2015, when she was in Islamabad for the Heart of Asia dialogue and on the sidelines how then Prime Minister Nawaz Sharif agreed to calling it a “Comprehensive Bilateral Dialogue”. How the word 'bilateral' was inserted purposely just to make it clear that outstanding issues between both countries would be settled in bilateral talks. She reminded Pakistan of the Shimla and the Lahore talks which called for bilateral resolution of disputes. The dialogue process was derailed after the January attack on the Pathankot airbase which was traced to Pakistan based groups by the investigators. Swaraj blamed Pakistan for supporting terror networks including Lashkar-e-Taiba, Jaish-e-Mohammad (JeM), the Haqqani Network and Hizbul Mujahideen, the group which is responsible for bulk of the violence in Kashmir. “If Pakistan had spent on development what it has spent on terror, both Pakistan and the world would be safer and better off today,” she said. Swaraj mentioned how not just India but other countries in the region too continue to suffer because of violence by terror outfits. She pointed out how Afghanistan and Bangladesh used their right to reply to Pakistani PM’s address. Swaraj, while claiming how India has been the oldest victim of terror, reminded the UNGA of the need to come to a common definition of terrorism, something which continues to stall the Comprehensive Convention on International Terrorism, which India has been championing since 1996. 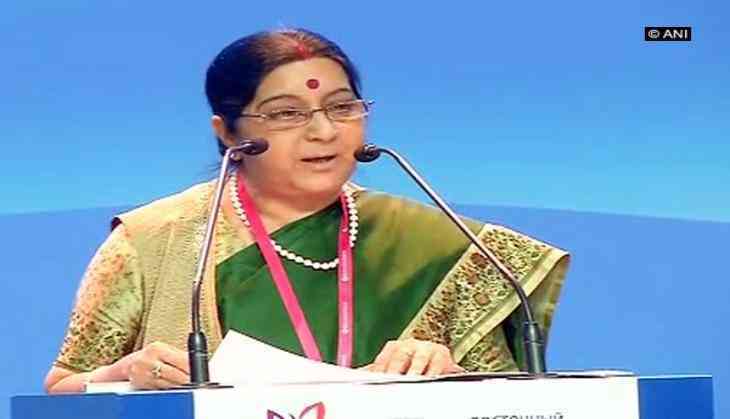 Swaraj took a dig at China which has been blocking the listing of JeM Chief Masood Azhar at the UNSC when she said “if even the UNSC cannot agree on the listing of terrorists how can we fight together”. Meanwhile, like in 2016, Swaraj reiterated India’s committment to the Paris Climate Change accord. She informed the UNGA of the steps India was taking to eradicate poverty and mentioned schemes like Jan Dhan Yojana, Mudra Yojana, Ujjwala, Skill India et al. She also mentioned how demonetisation has been a big step to take on corruption. Demanding a reform of the UNSC, Swaraj reminded how 160 countries had supported the reform and expansion of the important UN body and how there is a need to arrive at one text which could be basis of negotiations.